Srijan Labs showcases some exceptional pieces of codes, Proof of Concepts, Data Stories and experiments done by our team. Scenario building and ‘what-if’ analysis makes the backbone of an informed decision-making process and is an integral part of data analytics. We tried a small visualization exercise, with the objective of creating a dashboard for scenario building, where the user could put in various inputs and fetch results in the form of visualizations. 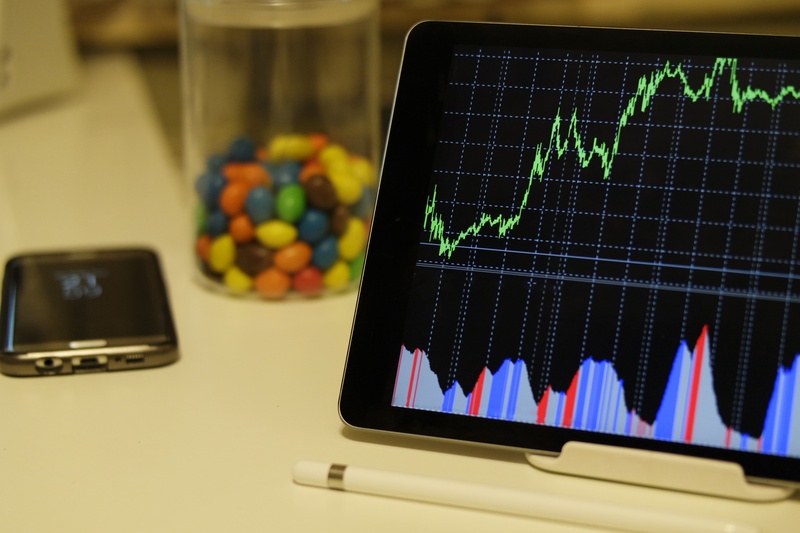 These visualizations allow the user to experiment with different scenarios, perform what-if analysis, and hence make an informed decision. We decided to build a dashboard that allows students to make an informed decision on the college subject they want to major in. The idea was that the dashboard should be able to showcase information on employment and salary prospects, based on the chosen major. Students could also view the impact on factors like economic growth and unemployment rates, on their future prospects. The intent of these tools has been to reduce the overall time taken in the above mentioned steps, which can be automated. This could mean connecting to different kinds of data environments, performing different kinds of joins between two or more data sources, performing calculations, transformations, imputing missing values, visualizing data in different ways, finding out correlations, averages, standard deviation etc. The final step is the presentation of the outcomes, which is indeed the most important step. An analysis is good only if it can be communicated well to the decision makers. For this dashboard, we decided to use Tableau desktop. Tableau offers a lot of presentation features besides the features on data connections, transformation, and analytics. The ‘Dashboard’ feature was used, which allowed the visualizations to talk to each other through filters & reset and helped create a coherent story. 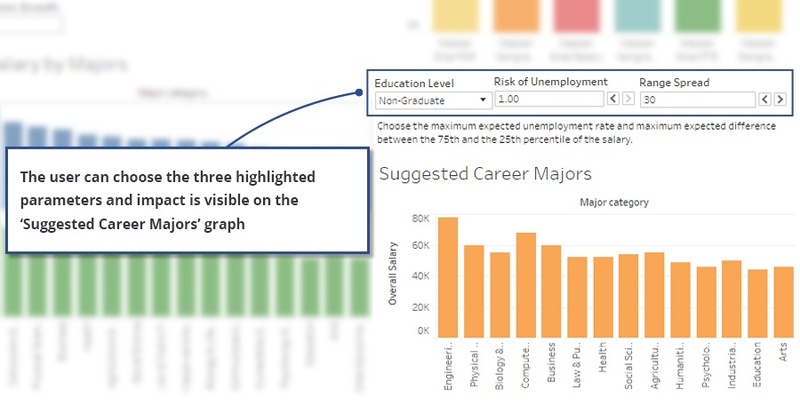 The College Majors Evaluation dashboard represents the final step of the analyst’s job and contains different visual representations and text to help users make decisions. It is conceptualized (done in-house at Srijan) to do a mock analysis of the US college majors by an aspiring undergraduate. The data used to create the dashboard is real and is sourced from here. The dashboard allows the user to perform various analyses by choosing/typing inputs and the impact is visualized using various graphs. 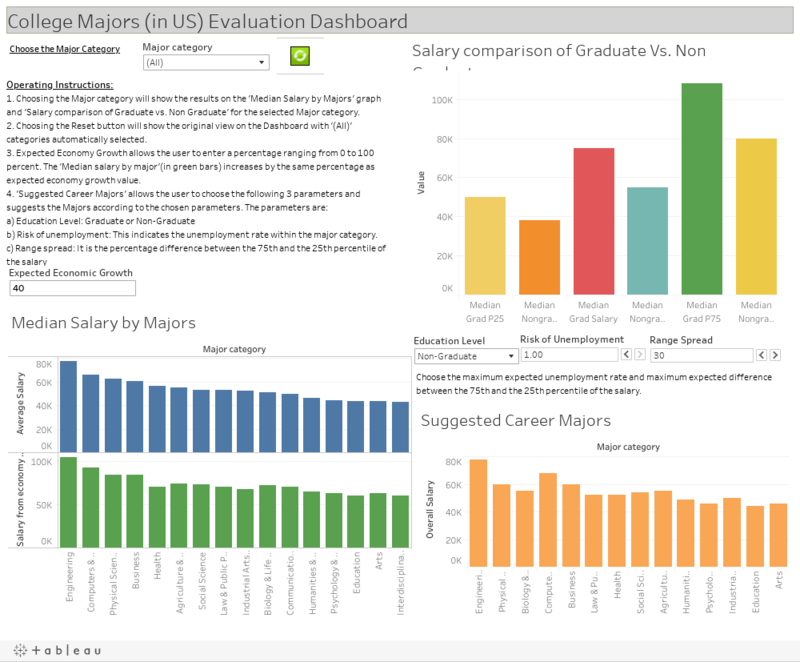 The Dashboard allows the user to choose from a list of college majors and on the ‘Median Salary by Majors’ graph user can view the median salary for the respective major. The ‘Salary comparison of Graduate Vs. Non-Graduate’ graph shows the salary comparison of non-graduate and graduate for the selected major with the use of median salary, 25th percentile salary, 75th percentile salary. 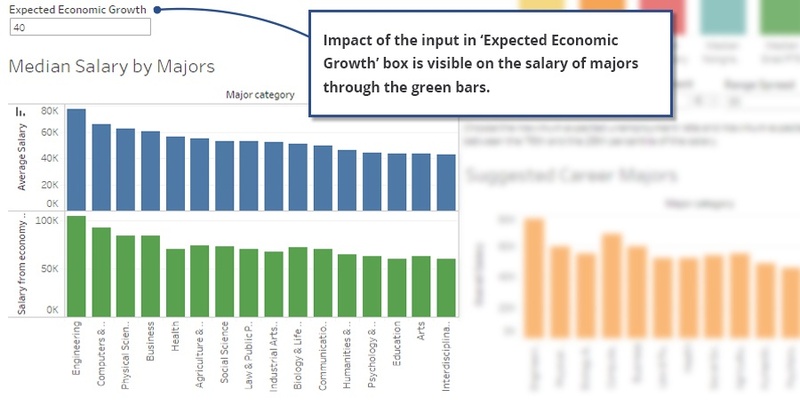 The user can also view the impact of economic growth on the salary of the selected major by entering an input in the Expected Economic Growth and the same is depicted in the green bars of the Median Salary by Majors graph. This dashboard also enables one more ‘What if’ analysis, by allowing the user to choose the level of education, unemployment rate and the interquartile range(the difference between the 75th and the 25th percentile), which is referred to as range spread in the dashboard. 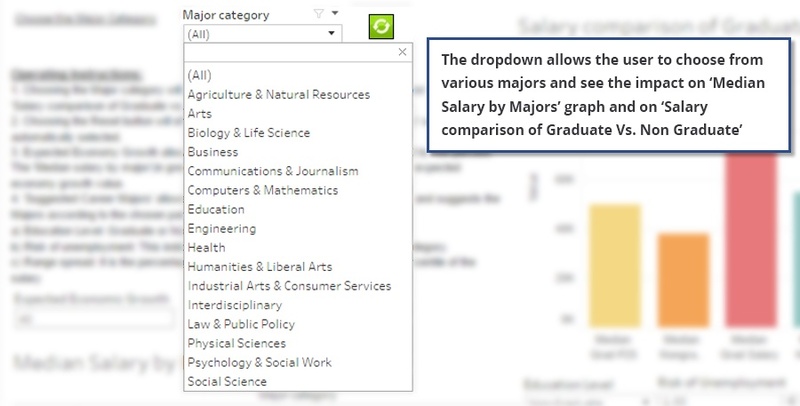 Once the inputs are chosen, the ‘Suggested Career Majors’ graph shows all the majors(along with the median salary), which fits the criteria of chosen inputs and hence helping the user choose the right major based on his choices. In the end, an undergraduate can analyze the impact of various options and the dashboard allows him to make an informed, thought-out, and analyzed decision on which major to opt for.